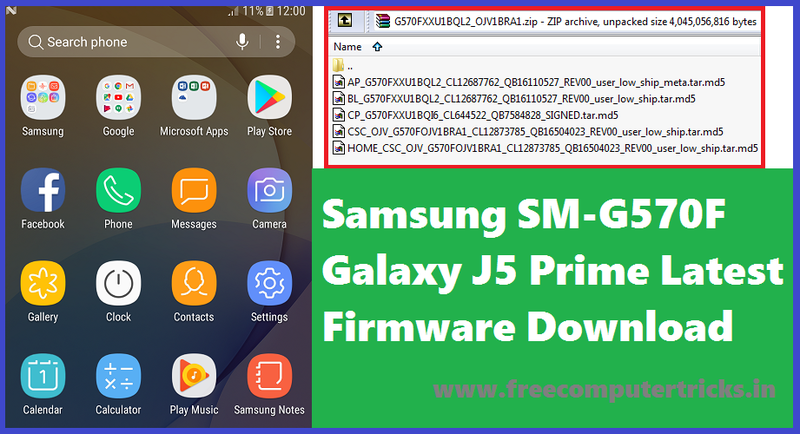 Here is the topic/tutorial about how you can flash Samsung SM-G570F Galaxy J5 Prime using latest firmware, which helps you to unlock the phone. You can flash the phone having Android 7.0 and Android 8.0 experience version and won't get any binary errors while flashing the J5 prime phone. If you are facing Custom Binary Blocked By FRP while flashing Samsung phone, then this firmware will help you to recover your phone without any errors, this process is tested and 100% working. The firmware is one of the latest firmware for the phone, which have Android 7.0 version and Samsung experience version 8.0. You can flash the phone using this OTA firmware to upgrade or install a fresh Operating System on the J5 prime phone. If the phone J5 Prime hangs on Logo and restarts then flash with this firmware it will solve the issue. You can also download latest firmware for the model here and flash the phone using ODIN3 flash tool. Why It's Called FRP Bypass Firmware? As I said before about the firmware version of this file, which has Android 7.0 and experience version 8.0 and Android security patch level version 1 December 2017, so in this version the Calculator ADB enable method will work fine, and the firmware can flash on the J5 prime phone having Android 7.0 with security patch 1 May 2018. As you know after 1 May 2018 Android security path level the Calculator method to enable USB debugging not work. So here is the finally and tested solution to unlock frp on J5 Prime which have Android security patch level 1 May 2018, what you have to do is just download the firmware and Samsung ODIN flash tool and flash the phone, then use the USB ADB or Debugging method and then use any flashing box tool to unlock frp. You can get an another topic on this website to know how to unlock frp for free using free tool and also to know how to unlock frp on Samsung J5 Prime having security patch level 1 May 2018, Links available below. Download latest firmware update for SM-G570F and flash the Samsung phone, using this firmware you flash the phone and update the phone to latest Android operating system. Download link is given above and visit the download firmware link and get your latest firmware for Samsung SM-G570F Galaxy J5 Prime Android 7.0.